Fifa vice-president Jim Boyce says he believes diving in football is becoming a "cancer within the game". He made his comments after watching footage of Liverpool's Luis Suarez going to ground during Sunday's 0-0 draw with Stoke at Anfield. "I have seen several incidents and the Suarez incident, and to me it is nothing less than cheating," he said. "It's becoming a cancer within the game. If it is clear it's simulation, they should be severely punished." 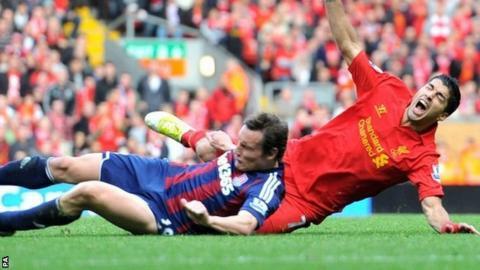 In September, Stoke boss Tony Pulis called for the Football Association to punish those found guilty of diving with three-match bans. Then on Sunday, he said striker Suarez deserved to be suspended for what he deemed to be diving during the draw at Anfield. Boyce also thought action was necessary, even if the initial incident had been missed by the match officials. "It can be dealt with retrospectively by disciplinary committees - it is done so in some associations - and I believe that is the correct thing to do," added the 68-year-old from Northern Ireland. "It can at times be very, very difficult for referees to judge whether something is a foul or a fair tackle and if players are diving then it makes their job even harder." An FA spokesman said: "Simulation is not something that the FA currently take retrospective action over but it is an issue that is often reviewed and discussed by the game's stakeholders." Liverpool manager Brendan Rodgers defended Suarez following the accusations from Pulis. "At this moment, there seems to be one set of rules for Luis and another set for everyone else," he said. "Diving and simulation is obviously a wider issue in football and one that we all agree has to be eradicated from our game, but there were other incidents this weekend that didn't seem to generate the same coverage."